The Battle of Tippecanoe was fought on this day in, 1811, near present-day Lafayette, Indiana between United States forces led by Governor William Henry Harrison of the Indiana Territory and Native American warriors associated with the Shawnee leader Tecumseh. Tecumseh and his brother Tenskwatawa (commonly known as “The Prophet”) were leaders of a confederacy of Native Americans from various tribes that opposed US expansion into Native territory. As tensions and violence increased, Governor Harrison marched with an army of about 1,000 men to disperse the confederacy’s headquarters at Prophetstown, near the confluence of the Tippecanoe and Wabash Rivers. Tecumseh, not yet ready to oppose the United States by force, was away recruiting allies when Harrison’s army arrived. Tenskwatawa, a spiritual leader but not a military man, was in charge. Harrison camped near Prophetstown on November 6 and arranged to meet with Tenskwatawa the following day. Early the next morning, warriors from Prophetstown attacked Harrison’s army. Although the outnumbered attackers took Harrison’s army by surprise, Harrison and his men stood their ground for more than two hours. The Natives were ultimately repulsed when their ammunition ran low. After the battle, the Natives abandoned Prophetstown and Harrison’s men burned it to the ground, destroyed the food supplies stored up for the winter, and returned home. Harrison, having accomplished his goal of destroying Prophetstown, proclaimed that he had won a decisive victory. He acquired the nickname “Tippecanoe”, which was popularized in the song “Tippecanoe and Tyler too” during the election of 1840, when Harrison was elected president. The defeat was a setback for Tecumseh’s confederacy from which it never fully recovered. However, the Natives soon rebuilt Prophetstown, and frontier violence increased after the battle until Tecumseh was finally killed in 1813. 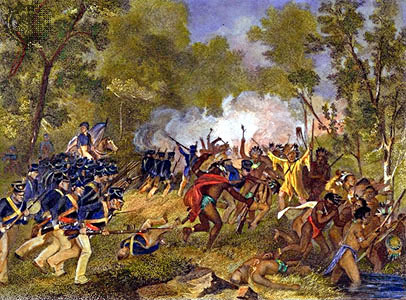 American public opinion blamed the violence on British interference—in terms of financial and munitions support for the Indians. This suspicion led to further deterioration of US relations with Great Britain and served as a catalyst of the War of 1812, which began six months later. By the time the US declared war on Great Britain in June 1812, Tecumseh’s confederacy was ready to launch its war against the United States in alliance with the British.